One of the books in that stack of library books I got was this one. You know those kind of recipe books that have you drooling when you look through them? It's one of those. So many recipes with fresh veggies...makes me wish I had more stuff ready in the garden. Lucky for me I still have stuff from last year's garden in the freezer. 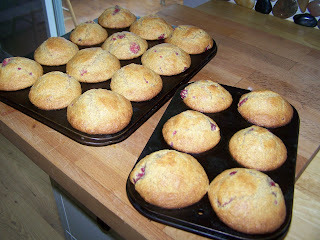 I used up the last of the raspberries to make these raspberry cornmeal muffins. Yum!! I was going to see if I could link to the recipe but I couldn't find it on their website. However, I did find lots of others and they all sound good. (I am sooo making the Rustic Summer Crostada as soon as I have enough ripe tomatoes) Here is the link. 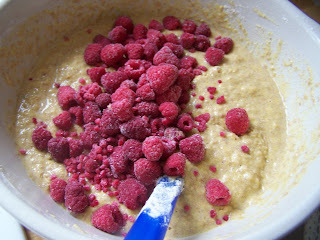 And if you want another recipe link for a yummy treat I put the requested pear cake one here.